Two unidentified Nigerian siblings aged 11 and 10, were rescued in the Mediterranean on Friday after losing their mother while on a dangerous journey to Europe. 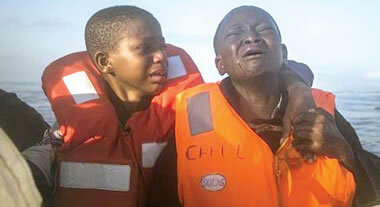 The heartbreaking photographs of the boy and girl by Associated Press were published by Dailymail as they sobbed and comforted each other aboard a rescue boat. According to Dailymail, the children were part of 150 migrants rescued by an NGO's boat while trying to make the journey from Libya to Europe aboard an overcrowded craft. A leading migration group had said more than 3,000 people had died while trying to cross the Mediterranean this year, nearly a 60 per cent increase from this time in 2015. The latest rescue came after Italy on Thursday launched a hard-hitting campaign on the Internet, TV, radio and social media to warn African migrants of the many dangers they face in trying to reach Europe.